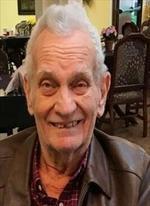 Ray Norman Scarbrough, 81 passed from this life on January 26, 2019. A graveside service will be held at 10:00am on Saturday, February 2, 2019 in the Fairlawn Cemetery. Strode Funeral Home and Cremation is in charge of the service. Ray was born March 31, 1937 and was a longtime resident of Stillwater. After graduating from Stillwater High School, he went on to work for the Stillwater Police Department during the 1960’s and 1970’s. He also worked for the Lee Company and other various jobs. Ray was a two-term city councilman for the City of Stillwater. Ray is preceded in death by his parents and one brother. He is survived by two sons and his brother. In lieu of flowers, the family requests that donations be made to The Mission of Hope, 1804 S. Perkins Rd. Stillwater, OK. 74074. To send flowers to the family of Ray Norman Scarbrough, please visit our Heartfelt Sympathies Store.